Jessamy Bright is pleased to see that some women in Southeast Ohio are eager to learn more about self-defense and safely using firearms. Bright, who founded The Well Armed Woman’s southeast Ohio chapter in Meigs County in 2014, says it’s important for women to be their own self-protectors and first responders. The Well Armed Woman is a national organization with 372 chapters across the country. 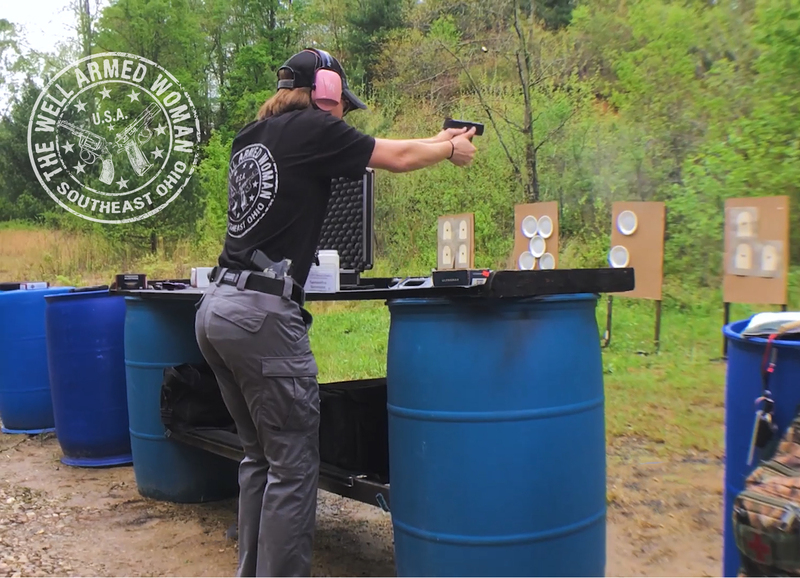 A nonprofit organization, The Well Armed Woman strives to empower women to use guns to defend themselves and teach them gun safety. The #MeToo movement is drawing greater awareness to sexual assault and harassment in the workforce and everyday life. Even though gun control and gun ownership are controversial topics, women in Bright’s chapter focus on learning to use firearms as a form of protection. Carla Shuler, a co-leader of the chapter, also says response times can vary—police officers or other law enforcement may take 20-25 minutes to come help a woman who is in a dire situation. Samantha Simmons, co-leader of Meigs County’s Well Armed Woman chapter, shooting at the chapter’s range at Party Barn Weddings and Receptions in Pomeroy. Samantha Simmons, a co-leader of the chapter, says women in the chapter have the right mindset coming in: They’re professional and want to learn how they can improve their self-defense. She says people outside the group view the chapter as being responsible gun owners who want to carry and have firearms for protection. Though the chapter learns about safely using firearms, Simmons also says it’s important that Bright diversifies the types of self-defense the chapter learns. The chapter has done empty-handed exercises and has occasionally participated in martial arts training. To Bright, situational awareness is important as well. She says it’s important that women are comfortable knowing what they might have to do in certain situations. With the group fulfilling its mission, the fellowship and camaraderie in the chapter are important, too. Bright emphasizes safety with her group, but she also wants her chapter to have fun. Every August for the chapter’s anniversary, the group has a potluck. The chapter also does something different on the shooting range each anniversary. Bright was able to build a private shooting range at Party Barn Weddings and Receptions in Pomeroy, which is where the chapter goes to shoot and have meetings. In 2018, the chapter did range drills with the official Well Armed Woman Q target. In 2017, the chapter had its own bingo game in which each member drew a bingo card on poster board. Whenever a woman’s number came up, she shot the number on the board. Bright says the chapter members enjoyed the activity. Shuler says although the current culture has people too focused on themselves, the women in the chapter aren’t like that. The group is positive, and women are always looking to pick up one another. Each woman is simply learning how to better defend herself, and the fellowship the group has helps foster a positive environment.